Vincenzo Nibali came into this Giro as returning champion with the number one pinned on his jersey. In the end, he wasn’t able to make it two in a row but he did produce an exciting win in stage 16 but he is always a danger and his grand tour record is incredibly impressive. He’s taken 7 stages in the Giro; 5 stages in the Tour de France and 1 stage in the Vuelta. He’s won the Giro twice (2013, 2016) and on the podium three times (2nd, 2011; 3rd, 2010, 2017); he’s won the Tour de France once (2014) and took third in 2012; and he’s won the Vuelta once (2010) and was second on the podium in 2013. He doesn’t look to be quite finished yet either. There were a lot of first-time winners in this Giro: Omar Fraile (Dimension Data), Bob Jungels – BOB JUNGELS and Fernando Gaviria from Quickstep, Tejay van Garderen and Silvan Dillier from BMC, Jos van Emden (LottoNL-Jumbo), Pierre Rolland (Cannondale-Drapac), Lukas Postlberger (Bora-Hansgrohe), Caleb Ewan (Orica-Scott), Thibaut Pinot (FDJ) and Gorka Izagirre (Movistar). And although they all won in different ways and with different styles, one thing was true of almost all of them. They were overcome with emotion at the finish line – some because it was their first grand tour win ever [see D for Dutch], but some, like Tejay and Rolland [see I for interview], because they weren’t sure they would ever get another shot at grand tour glory. And some cried just because they won a stage at the Giro. Oh, we do love our FDJ superstar, Thibaut Pinot. There’s nothing quite like seeing the tall, lean Frenchman, clad in snowy white, attack on a climb in the sunshine. And that’s just what he did on Stage 20, when he attacked his lead group to take a magnificent win in a grand tour he has come to love. And I think the Giro loves him – he’s more relaxed than in the Tour (no ‘weight of the nation’ complications here) and he just seemed to get better and better as the weeks went on. Shame about the abyssmal time trials or he might very well have been on the final podium. But there’s always next year. For being known as a classics team, Quickstep Floors absolutely bossed this Giro in so many ways. We had Fernando Gaviria dominating the sprints, wearing the maglia rosa, winning the maglia ciclamino, having a brilliant haircut and braces. We had Bob Jungels – BOB JUNGELS – winning one of the most exciting stages of the three weeks, wearing the maglia rosa, winning the maglia bianca on the last stage, having a haircut right out of the 1940s; we had the entire team pulling their weight, taking care of each other and geeing the crowds up. Yeah baby! Only God can judge him, but we think that this was most probably Pippo Pozzato‘s last Giro. That said, he’s not come right out and said this would be it, but we just had that feeling. One rider – a particularly favourite here at VeloVoices Towers – who definitely has ridden his last Giro is Manuel Quinziato, who is retiring at the end of this season. And he went out of the Giro in style – wearing his beautiful Italian national champion’s skinsuit in the time trial and posting a more than respectable third, behind the two flying Dutchmen. Quinzy … we salute you! Even the Queen loves you! While we can find examples of when the gentleman’s rules of sportsmanship were stretched (some say broken) in this Giro d’Italia, we can also find examples of when they were honoured. Astana’s Luis Leon Sanchez had been in breaks for most of the mountain stages, looking for that win in which to honour his fallen teammate, Michele Scarponi, unfortunately to no avail. 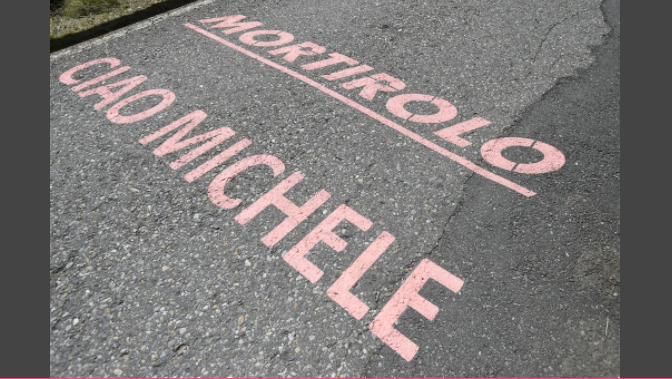 Stage 16, the summit of the Mortirolo was christened Cima Scarponi by the organisers and in a compassionate and beautiful gesture by his breakaway companions (including Fraile who was chasing KOM points), Sanchez was allowed to crest first, by himself. Dimension Data’s Daniel Teklehaimanot always goes about his business with a quiet elegance and this Giro was no exception. He was the first Eritrean to ever wear the maglia azzurra, which he earned in stages 2 and 3, and he won the overall intermediate sprints competition. Looking forward to seeing him in polka dots in the Tour. The UCI has a very warped sense of humour – or else a skewed definition of what ‘damages the image of cycling’. Seriously, this is what damages the image of cycling, UCI? This?! Good news is that Carlien, the woman who Victor Campenaerts addresses on his chest, said yes and Victor brought a light touch to Giro100. UCI, you should give him 100 Swiss francs to help pay for a fine meal. The Tour de France might have riders cycling (and sometimes running) up the lunar landscape of Mont Ventoux but the Giro – the Giro had them riding up an active volcano! Stage 4 was a summit finish on Mount Etna as the Giro island-hopped from Sardinia. Jan Polanc (UAE Emirates) won the stage solo in a well-timed attack out of the break. W is for Where’d you get them boots? Nairo Quintana started the final stage in pink and since it was a time trial, he was in the pink skinsuit. And not just that – he was in his pink go-go boots as well! At the end of the stage, he lost the maglia rosa to finish on the second step of the podium. His grand tour record stands as one Giro victory (2014), 2nd this year, three stages (2014, 2017); Tour de France second step 2013, 2015, 3rd 2016, with one stage win in 2013 and Vuelta champion in 2016, with one stage victory in that race. At the start of this year, Quintana said he was going to go for the Giro-Tour double, which always sounded a little ambitious. It will be interesting to see how much the Giro has taken out of him in July. Orica-Scott were continuing their Backstage Pass series during Giro100 and, jealous that Patrick Dempsey dropped by the race to take a ride with the BMC boys, they put a call out to Hugh Jackman to be their mascot. Our young dude for the Giro was Mads Pedersen, which thrilled Midge no end! The 21-year-old made it through the entire Giro and put in a fine performance in the final time trial, finishing 12th on the day, and finished 138th overall. Katusha-Alpecin made their presence known in this Giro, working hard to try to get their young leader, Ilnur Zakarin, onto the podium. When others sat on wheels, seemingly waiting for Tom Dumoulin to crack before they attacked, Zakarin would always be trying to force the selection – particularly on stage 20, when he put his lieutenants on the front of the peloton on Monte Grappa and busted the peloton to smithereens. Zakarin finished the Giro in 5th but I suspect it won’t be long before he climbs onto a grand tour podium. Z is for Zoncolan. Rumour has it, the organisers are going for a double ascent in 2018. Cannot wait! For all stage results and final classifications, go to the official Giro website.